One of our favourite geocaches in Calgary is GCA0D6 – Stash n’ Dash. Originally placed in November 2002, the concept for this not quite unique cache is to pick it up when you find it and move it – in this case to another park within the Calgary city limits. Over almost 10 years, the rules of play have evolved along with the game; for example, you can’t find Stash n’ Dash more frequently than every 20 days, which reflects the increasing number of geocachers out there. Stash n’ Dash has been moved 745 times, accumulating a total distance travelled of almost 8,000 km (5,000 miles) (almost) all within Calgary city limits. Somewhere around 175 geocaching screen names have logged Stash n’ Dash as found, with only 3 aggregating more than 30 finds. The geocacher who’s found it the most is Sleepy_hollow, Alberta’s most prolific finder (currently ranked 120 in the world). To-date, he’s found Stash n’ Dash 63 times! We recently found Stash n’ Dash for the 10th time (2007 – 1, 2008 – 2, 2009 – 5, 2010 – 1, 2011 – 0, 2012 – 1), which puts us into a smallish group of about 20 geocachers that have found Stash n’ Dash at least 10 times. After retrieving Stash n’ Dash from the western edge of the city late last week, we swapped out travel bugs and then waited for a fine day to head out in search of a new temporary home for this moving cache. Not far from our home coordinates, we spotted a good hiding spot with a nice view of the city skyline. 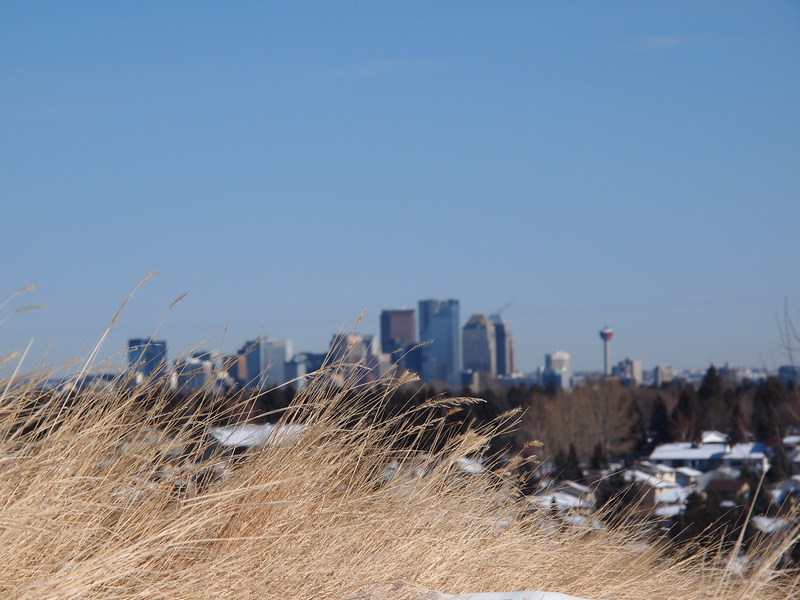 View of the Calgary city skyline from the hiding spot selected to put Stash n' Dash back in play. While we had temporary custody of Stash n' Dash, I snapped a quick picture to give some idea of size / construction. This is the second version of Stash n' Dash, as the original container disappeared a while back. This was our first time finding the resurrected Stash n' Dash. In past years, Mrs. GeoK sewed a camo bag for Stash n’ Dash. If memory serves, somebody found the cache not too long afterwards, took its camo bag and left the container in place! Stash has also sported a burlap camo sack! The one constant is that whoever finds Stash has to leave a strip of flagging when they pick it up, so that other cachers will know its been picked up if they go looking before a note or log is posted to the cache page. We’d like to send a big “shout out” of THANKS to outforthehunt for placing this one so many years. 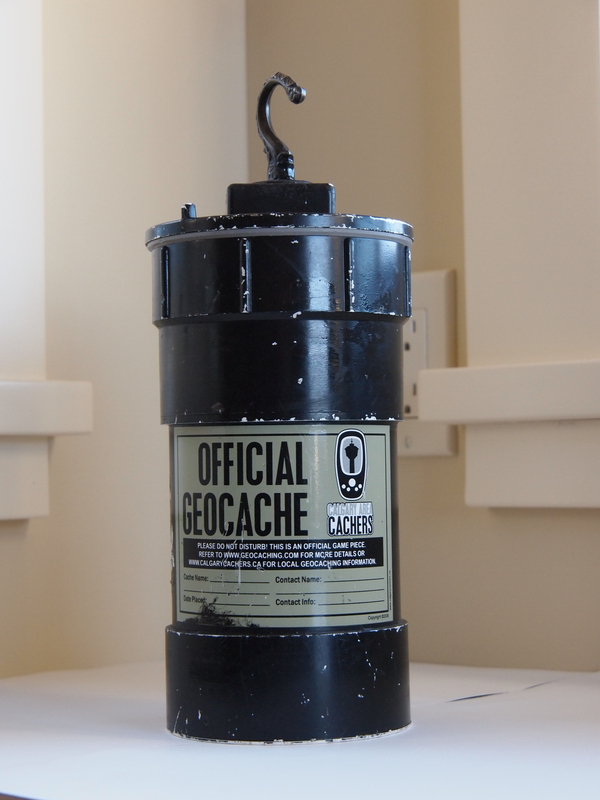 It’s a long-standing favourite of the Calgary caching community! February 17, 2012 in Geocaching.